Special arrangement for Mother day celebration. Ordered a set menu and awaiting to be serve. The menu is in Chinese as shown. 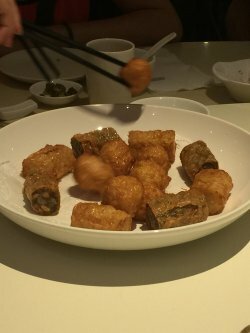 Of all the dish, recommends breaded fish maw , Thai style marble goby fish and braided pork shrunk. 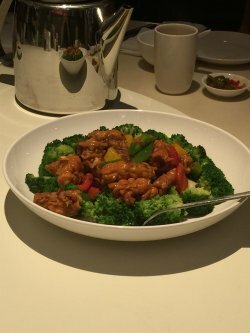 The taste is very well done and fresh ingredients mixture. 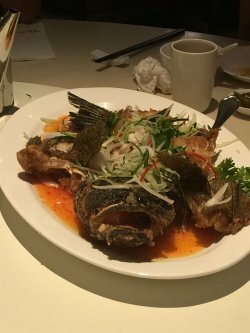 Thai fish is crispy and soft meat served with sliced vegetables. 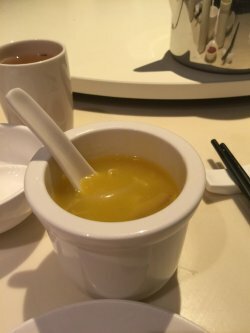 This sauce is well balance of sweet and sour too. Overall is filling for 25member. Tunglok also served a special drink not sure this name. Ha. 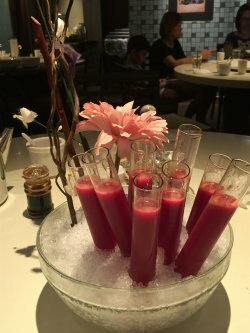 Look like Dracula blood drink. Taste like fruit and wine combination. 3 of us went to tunglok teahouse at square 2 for lunch. 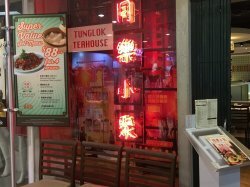 i was a bit surprised actually the food at tunglok teahouse is really quite below par! 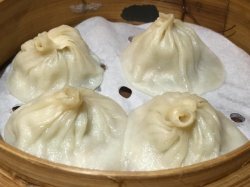 the xiaolongbao 小笼包 broke off when i tried to lift it gingerly onto my spoon, i don’t have that at impreial treasure or canton paradise. the soup was sweet ok, the meat fillings less so. 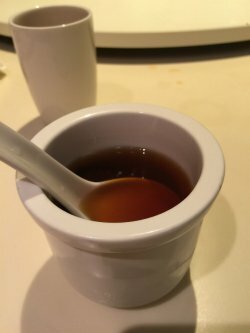 the har gao was quite poor. 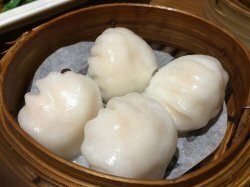 the skin looked & was thick & doughy, the prawns were ok.
couldn’t remember the name of this dumpling. looked like the 潮州粉果. i was quite sure the name was not. 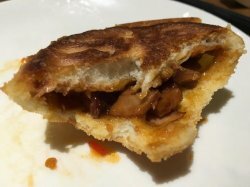 this looked like any other crispy char siew pao. but the fillings were not so tasty, the skin was a bit harder than most. i had this at red house with my sis & bil the day before & again on sunday when my wife invited friends there. red house’s crispy char siew pao was very good, so no comparison la. 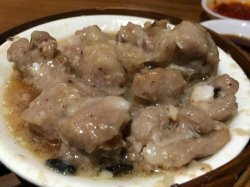 the steamed pork ribs were actualy ok, tasted good, but c/w red house photo, presentation was messy lacked the same class, and did not have yam. 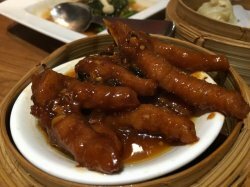 chicken feet was also quite good. this spinach beancurd三层楼 i cannot understand. i think it was really bad by tunglok & 三层楼 standard. the first 三层楼 i have taken was at tunglok’s zhou kitchen i think at alexandra point (which is now the tunglok teahouse brand) maybe 15-20years back. it has always been good, & still good at tunglok signatures. but this tofu was hard & chewy not crispy & soft inside. downright bad! 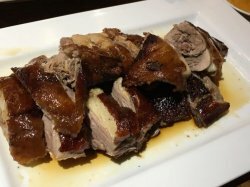 the 1/2 roast london duck was S$28. it is S$32 at tunglok signatures. taste was still ok though i think still quite a gulf…presentation & texture was totally off. it’s like reheat or leftover parts instead of 1/2 duck. 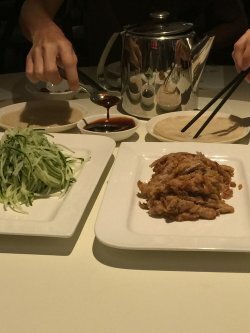 see the roast duck at the other places! i find that quite difficult to understand? don’t they use central kitchen & just differential pricing? or it was just very bad quality control in terms of food storage, presentation etc? 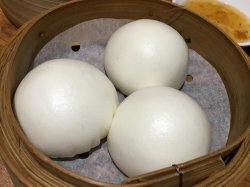 the salted egg custard bun流沙包 was also poor. both the salted egg custard & the skin were poor. lunch for 3pax came to S$79 after 35% amex palate discounts. not too costly. 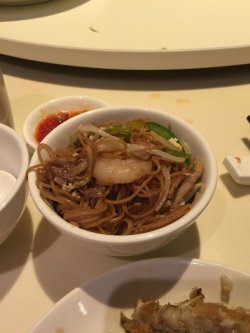 but before price, the food must meet some minimum standard, so for me this was not value for money not a place i would return to. there's one last thing still to be said. the attitude of the lady captain was very bad! she walked off with a black face after unsuccesful on getting us to order some expensive recommendations. 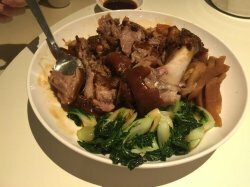 fortunately the service was at least redeemed by some chinese waitress who was quite polite & ok service with a smile..
1/2 roast london duck - bad! 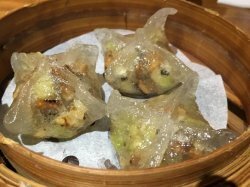 some dumplings - this one was good! 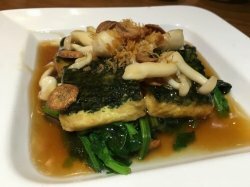 spinach tofu - very bad!! !